February 25, 2019 – Dallas, Texas – Re-Teck, a member of the Li Tong Group with regional facilities in Grand Prairie, Texas; Milpitas, California and US headquarters in Redwood City, California, is a global market leader in Reverse Supply Chain Management solutions for Original Equipment Manufacturers (OEMs), enterprises, government, schools and consumers. Re-Teck was selected by Rebuilding Our Heroes as the preferred vendor for materials to construct eco-friendly mini-homes built by veterans for veterans. The partnership is fitting for both organizations whose focus is on reclaiming, repurposing, and recycling in order to create a better life for others. For more information on Re-Teck, visit www.re-teck.com. 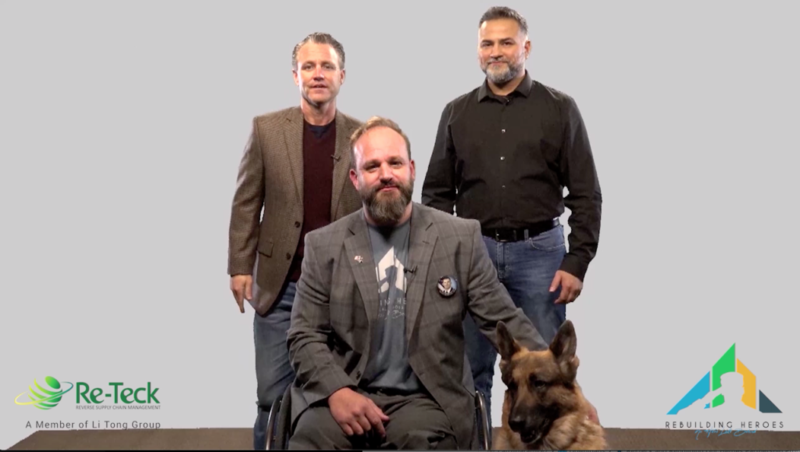 For more information about Rebuilding Our Heroes, visit www.rebuildingourheroes.org. Re-Teck is a member of Li Tong Group (LTG). LTG is the global market leader in Reverse Supply Chain Management (RSCM) solutions for OEMs, enterprises, government, and consumers for the reuse, remanufacture and recovery (3R) of both Post-Industrial Recovery (PIR) and Post-Consumer Recycling (PCR) and hi-tech products and components including mobile devices, smart devices, big-data network and telecom equipment. In the past 19 years, LTG has developed a global network of 20+ wholly owned facilities across North America, APAC, EU, MEA and Latin America, which currently serves more than 100 customers and employs more than 1,200 people worldwide. It has an extensive patent portfolio for innovative methods and automated systems of digital processing and reclamation technologies.